We are thrilled to announce the first annual Bridget Slotemaker Award recipient! Alex and Ani’s Charity by Design is a lifestyle brand so deserving of this honor for its extraordinary commitment to supporting all courageous women who must face a breast cancer diagnosis. Alex and Ani has supported the Young and Strong program for years through both the creation of the Young and Strong bangle as well as sponsorship of An Evening for Bridget, which has raised over $500,000 in honor of Bridget Slotemaker, since its inception in 2009. The Young and Strong bangle was collaboratively created by Designer Carolyn Rafaelian, Founder, Creative Director and CEO and Charity by Design, a unique division focused solely on giving and empowering non-profit organizations both on a national and local scale to reach their goals by sharing their mission through the power of positive energy and creative design. A portion of proceeds from Charity by Design bangles are donated directly to non-profits who are dedicated to making a difference. 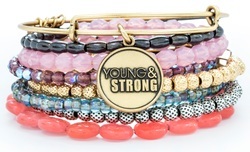 To date, Alex and Ani has donated over $141,000 to the Young and Strong program. We can’t think of a better recipient than Geralyn Lucas for the first annual Bridget Mooney Spence Award! Geralyn is an award-winning TV producer, author, lecturer and women's health advocate; not to mention a breast cancer survivor since the age of 27. She has spent the years since her diagnosis committed to promoting breast cancer awareness and providing courage and hope to thousands of women by sharing her own story. Her memoir, Why I Wore Lipstick to My Mastectomy, became an Emmy-nominated Lifetime Original movie and her story was recently featured in Nora and Delia Ephron’s off-Broadway hit Love, Loss, and What I Wore. She is a sought-after lecturer, delivering the keynote address to the Oncology Nursing Society’s 5000-member congress and performing in the “Smart Talk Women’s Lecture Series,” a stage she shared with Tina Brown, Maya Angelou, and Isabella Rossellini. In Then Came Life, the upcoming sequel to her memoir, Geralyn explores what it means to survive cancer with honesty, humility and humor.